At 11:14 and 48 seconds on September 10th 1976, two paints on a radar screen at Air Traffic Control Zagreb - Croatia, merged, parted for a moment, then disappeared. Those paints represented the lives of 176 people. (1) This is an account of one of the worlds worst mid-air collisions. In 1976, Zagreb Air Traffic Control was one of the busiest centres in Europe. The Zagreb VOR beacon formed a junction for heavily used airways used by en-route air traffic to and from South Eastern Europe, the Middle East, the Far East and beyond. To look after all this traffic were a group of understaffed and overworked Air Traffic Controllers using a radar system which was 'under test' and radio transmitters that often failed to work. The airspace Zagreb controlled was divided by altitude into three sectors. The lower sector controlled aircraft below 24000 feet, the middle sector between 24000ft and 31000ft, and the upper sector which controlled aircraft above 31000 feet. The radar display for a particular sector would clearly show an aircraft flying in that sector by its radar paint indicating the aircraft's position, accompanied by its flight number derived from the aircraft's transponder squawk code, and its altitude represented by a Flight Level. An aircraft flying at an altitude of 35000 feet would be at a flight level of three-five-zero or FL350. Aircraft above or below this sector would be represented as a simple paint on the screen, thus reducing the amount of unnecessary clutter. This arrangement was achieved by allocating a range of squawk codes for each sector, the middle sector was assigned a range 2500 - 2577, and upper sector 2300 - 2377. At 08:25 local time, a British European Airways Hawker Siddeley Trident 3B ( G- AWZT) flight number BEA476, with 54 passengers and a crew of 9 aboard departed London's Heathrow airport bound for Istanbul, Turkey. Its route would take it across Europe, overflying Brussels, Munich, Zagreb thence onto Turkey. The morning shift at Zagreb ACC ( Air Control Centre ) consisted of 5 controllers that would work the middle and upper sectors. The middle sector was manned by Gradimir Pelin and Bojan Erjavec, the upper sector manned by Gradimir Tasic, Mladen Hochberger and Nenad Tepes. The controllers would use the radar only as a back-up, as it had not been commissioned since it had been installed two years earlier. This meant that aircraft separation was to be maintained by a process called procedural control, which requires pilots to make position reports at designated waypoints and provide an estimated time of arrival for their next position. Lifting off the runway at Split aerodrome at 10:48 local time was JP550, a DC-9 ( YU- AJR ) of the Inex Adria airline company , with 108 passengers and 5 crew aboard. Almost all the passengers were Germans holidaying on the Croatian coast and returning to Cologne, Germany. The pilot, Captain Krumpak had requested prior to departure, to cruise at 31000ft for the flight to Cologne, but was given initial clearance to climb to 26000ft. Meanwhile the Trident was over Austria, under the control of Vienna ACC cruising at 33000ft. It flew a track that took it over Munich down to the Villach VOR, where it turned left and onwards to Klaganfurt. Overhead the Klagenfurt VOR it would turn right to fly along airway Upper Blue 5, or UB5, at which point it entered Zagreb's airspace and eventually cross the Zagreb VOR. Split is located 140nm south of Zagreb on the Adratic coast, once the DC-9 was overhead the Split VOR climbing through 12000ft it was instructed to contact the Zagreb ACC lower sector frequency. The time used against transcripts are GMT. 09:54:49 JP550 Dobar dan ( Good day ) Zagreb, Adria 550 crossing 130, Climbing 180, heading Kostajnica. 09:55:01 Zagreb Low Roger, recleared 240, Adria 550. The DC-9 pilot calls the lower sector controller using the companies call sign Adria. He states that he is currently passing through 13000ft and climbing to maintain 18000ft and heading northwards towards the Kostajnica non-directional beacon, located 40nm south of Zagreb. The controller acknowledges his call and reclears the DC-9 to climb to 24000ft. Ahead of JP550 was JP548 bound for Nuremburg, which had departed Split and was also headed towards Kostajnica on UB9. 09:55:22 Zagreb Low Adria 548 level check ? The controller then reclears JP550 to climb to FL260, this would be as high as it could go for the time being. Ahead was JP548 on the same route climbing to cruse 28000ft and an Olympic Airways aircraft ( OA187 ) that would join airway UB9 overhead Zagreb cruising at 31000ft. This meant that The DC-9 would be held at 26000ft, unless it were to request the next available cruising level, 35000ft. 09:55:50 Zagreb Low Adria 550, recleared 260, call passing 220. As the pilot had not replied to this instruction, again the controller called JP550. 09:56:06 JP550 Cleared 260 and call you passing 240, do you read me ? The controller now replied with a confirmation that he requested a call when passing FL220 and not FL240. 09:56:15 JP550 I will call you passing 220. JP548 was now approaching an altitude that would soon see it come under the control of the middle sector at 24000ft. 09:58:12 Zagreb Low Adria 548, contact Zagreb 135.8 , Good-day. 09:58:17 JP548 Adria 135.8 ... 548, Goodbye. A check to see what altitude JP550 was passing through the controller again called the DC-9. 09:59:53 Zagreb Low Adria 550, level check ? Responding to the earlier instruction to report passing FL220, JP550 called the controller. Zagreb Low Zagreb, 135.8, Good-day .. This was the instruction for DC-9 to contact the Zagreb middle sector frequency on 135.8MHz. It was standard practice at Zagreb ACC for a Flight Progress Strip to be prepared for every sector that an aircraft intends to pass through. As JP550 was planned to cruise at FL310, two flight strips should have been prepared, one for the lower sector and another for the middle sector. Only one flight strip was prepared, this was for the lower sector. When JP550 was instructed to contact the middle sector frequency, there was no flight strip available to the middle sector controllers. This in itself was of no major consequence, the lower sector controller would have taken the flight strip from his rack and handed it over to either Erjavec or Pelin ( sitting at the next console ), at a point prior to instructing JP550 to contact the middle sector. All details regarding the DC-9s flight would have been passed on in good time. From 11am local time, Bojan Erjavec was working the middle sector with his assistant Gradimir Pelin. Pelin was responsible for communicating via telephone with other ACC for the purpose of coordinating the handing over of traffic to and from those centres. The upper sector was controlled by Gradimir Tasic and Mladen Hochberger who was working as his assistant. At 11am Hochberger was to be relieved by Nenad Tepes, but Tepes had not shown up. At the time JP550 was given the frequency change to call the Zagreb middle sector, the British Trident cruising at FL330 was approaching the Klagenfurt VOR, Vienna had instructed its pilot to contact Zagreb upper on frequency 134.45MHz soon passing Klagenfurt. Still climbing to 26000ft, the captain of the DC-9 contacts the Zagreb middle sector controller, Erjavec. 10:03:21 JP550 Dobar dan ( Good day ) Zagreb, Adria 550 crossing 225, climbing 260. 10:03:28 Zagreb Mid 550, good-morning, Squawk Alpha 2506, continue climb 260. Erjavec had instructed JP550 to continue its climb to 26000ft, and to squawk the allocated code for this flight. Soon the radar paint on Erjavec's screen which was that for the DC-9 would be accompanied by a data tag which contains the aircraft flight number and its altitude. On the screen of the upper sector, the DC-9 would still remain a simple radar paint heading northwards towards Kostajnica. Once positively identifying the DC-9, Erjavec called JP550. 10:03:38 Zagreb Mid That is correct, inbound KOS, Zagreb, Graz next. Having complied to Vienna's instruction to call Zagreb, Captain Tann contacted Zagreb upper using the British European Airways callsign, Bealine. 10:04:12 BEA476 Zagreb, Bealine 476, good-morning. Zagreb Upp Bealine 476, good-morning, go ahead. 10:04:19 BEA476 Er, 476, is Klagenfurt at 02, 330 and estimating Zagreb at One Four. Gradimir Tasic now gives a squawk code and tells him to report passing Zagreb at FL330. 10:04:27 Zagreb Upp Bealine 476, roger, call me passing Zagreb, flight level 330, Squawk Alpha 2312. 10:04:38 BEA476 2312 is comming. The Squawk now positively identified the Trident on Tasic's screen, flying along airway UB5 heading towards Zagreb ( flying a magnetic heading of 115° ). Meanwhile the DC-9 still climbing and approaching FL260 calls for a higher altitude. 10:05:57 JP550 Adria 550, levelling 260, standing by for higher. Erjavec tries to accommodate the request, FL280 is occupied by Adria 548 ahead, and FL310 is unavailable because of Olympic 187 en-route from Athens to Vienna. He informs JP550 of the situation and offers FL350. 10:06:03 Zagreb Mid 550, sorry, 330, er 310 is not available, 3 ... 280, also, are you able to climb, maybe to 350 ? 10:06:11 JP550 Affirmative, Affirmative, with pleasure. 10:06:13 Zagreb Mid Roger, call you back. To get clearance for a higher level, permission must be gained from the upper sector controller. Erjavec waves his hand to get Tasic's attention, but Tasic who is now working the upper sector on his own, with Hochberger gone to search for Tepes, he is much too busy to be interrupted. Pelin is now instructed to coordinate the climb out for the DC-9 with Tasic. What is said between the two controllers will be disputed. Pelin's account was that at approximately 10:07 he walked the meter or so across to the upper sector console holding JP550s flight progress strip. He asked Tasic if the DC-9 could climb to FL350. Tasic took the strip from Pelin and looked at it then asked where the aircraft was currently. Pelin then pointed to a blip on the screen approaching Kostajnica, Tasic's response was yes, it could climb. Pelin then noticed an aircraft on the screen coming from the direction of Metlika and quizzed Tasic, Tasic said wait until they cross. Pelin went back to the middle sector screen to make sure that he had identified the DC-9 positively on the upper sector screen, he then returned to Tasic and they both watched the targets pass each other, at which point Tasic said it may climb. Pelin then called out to Erjavec and said 'yes, climb it'. Tasic had a totally different account of this event. When Pelin approached him about the climb for the DC-9, he was busy talking to five other aircraft and Belgrade ACC. Tasic claims that he told Pelin that if JP550 could make FL310 before Kostajnica then it could continue to climb to FL350, if it could not meet that condition, then it was to remain at FL310 until passing Zagreb before it could climb again. On Erjevec receiving the OK from Pelin, he instructed the DC-9 to climb to 35000ft. 10:07:40 Zagreb Mid Adria 550, recleared flight level 350 ..
10:07:45 JP550 Thank you, climbing 350, Adria 550. At 10:07:50, Pelin called Vienna to notify that JP550 was to enter its airspace at FL350. Tasic during this period was heavily involved with traffic in his sector, without an assistant, he also had to arrange clearance for a number of aircraft to enter Belgrade airspace. From the time the Trident called Zagreb at 10:04:12 to the time he spoke to Pelin about the climb for DC-9, he had been in continuous contact with seven other aircraft issuing various instructions along with communicating with Belgrade. The two pilots in command of the Trident had a very ordinary flight across Europe, the first officer, Helm, had been reading a newspaper, even attempting a crossword puzzle. This did not prevent Captain Tann from hearing Tasic issue a change of frequency to Vienna control for Turk Air 889, looking out the cockpit window he said 'There he is ...' as the aircraft passed overhead in the opposite direction. This demonstrated that even though the atmosphere in the cockpit had been somewhat monotonous, the captain at least was listening out for other traffic. As Helm continued to read from the newspaper, at about the same time that the DC-9 was given clearance to climb, he tempted his own fate by reading out the following : 'A bit here, eight people injured in an air crash on Tuesday were killed when a helicopter taking them to hospital crashed .... '. 'Yeah, how unlucky can you get', replied Tann. 'Obviously wasn't their week', responded Helm. The DC-9 was now approaching Kostajnica and climbing, Erjavec called JP550. Thirty seconds later captain Krumpak now calls passing 29000ft. As the DC-9 now was approaching the upper limit of the middle sector at 31000ft, Erjavec again asked the pilot to call passing that level. 10:09:53 Zagreb Mid Roger, call me passing 310 now. The DC-9 took two minutes and 48 seconds to climb from 29000ft to 31000ft, at which point Krumpak calls Zagreb. 10:12:03 JP550 Zagreb, Adria 550, out of 310. 10:12:06 Zagreb Mid 550, for further Zagreb 134.45. Squwak stand by and good-day sir. 10:12:12 JP550 Squawk stand by, 134.45, good-day. This last instruction was for JP550 to call the upper sector frequency on 134.45MHz and to stop squawking the assigned squawk code. By instructing JP550 to Squawk Stand by, Erjavec simply released a code that was allocated for the middle sector, the DC-9 would now lose the data tag on his screen and become a paint among many others. If everything about this handover was normal, the DC-9 would be given a new code on initial contact with the upper sector, which it would then once again be positively identified on the upper sector screen with its Flight Number and altitude readout. But this had not been a normal handover because of the ill handle co-ordination for the climb four and a half minutes earlier. Tasic was now again busy with other traffic, JP550 did not immediately contact the upper sector frequency, this could have been because there was just too much radio communication going on at the time, or the DC-9 pilots delayed the call for some unknown reason. 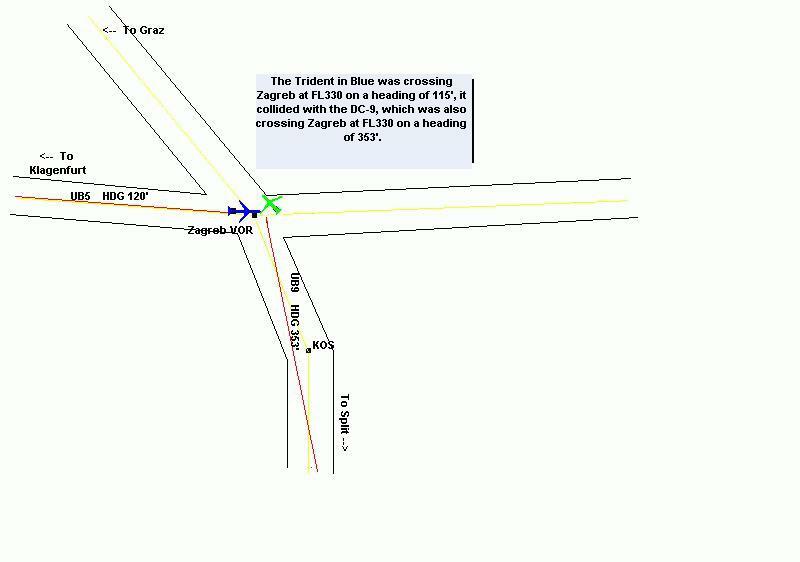 The shadow of the DC-9 paint was now just approaching Zagreb from the south on a heading of 353°, the Trident, clearly identified on Tasic's screen, was closing in from the west on a heading of 116°. For Tasic, even if he had time to notice the paint of the DC-9, it would have not been of any concern, as it was a regular occurrence for aircraft to pass each other overhead a waypoint. The tragic oversight here was that the DC-9 was climbing through 33000ft, directly in the path of the Trident. To give a clearer indication of the workload Tasic was under in the last moments prior to the collision, the following is the communication he had from the point JP550 was told to call the upper sector frequency. 10:12:10 Zagreb Upp Finnair 1673, report passing Delta Oscar Lima, maintain level 390, Squawk Alpha 2310. 10:12:20 AY1673 Will report passing Dolsko at 390. The exact time that Tasic was handed the DC-9 flight progress strip is disputable, but it would have been close to this time. Tasic may have held it in his hand while talking to other aircraft, its significance however did not register with him. 10:12:24 LH310 Lufthansa 310, Sarajevo at 09, 330, Kumanovo 31. Zagreb Upp Lufthansa 310, contact Belgrade, 134.45, sorry .. sorry 133.45, good-day. 10:12:40 OA172 Zagreb, Olympic 172, good-afternoon, level 330.. There is a small break in the communication here, possibly because it was around this time that Nenad Tepes arrived at the upper sector console to work as an assistant to Tasic. A few moments earlier, Tepes had met Hochberger at the entrance to the control room. According to Tepes, Hochberger had said it wasn't busy when asked about the traffic situation on the upper sector. This was the extent of the handover of shift procedure. The proper procedure would be for the handover to be conducted at the console, fully familiarising the new controller of the traffic situation. 10:12:48 Zagreb Upp Olympic 172, go ahead. OA172 Olympic 172, level 330, estimate Dolsko at 16. 10:13:00 Zagreb Upp Olympic 172, report passing Dolsko, flight level 330, Squawk Alpha 2303. 10:13:07 OA172 2303, call you passing Dolsko 330, and confirm cleared Dolsko direct KOS ? 10:13:15 Zagreb Upp Affirmative sir. 10:13:19 BE932 Zagreb, Beatours 932 is level 370, estimate Dolsko 18. Zagreb Upp 962, go ahead. Tasic is now under some pressure as evident with the slip in the callsign. 10:13:42 BE932 Beatours, 370, estimate Dolsko 18. Tepes is now talking to Belgrade, getting clearance for aircraft headed eastward. There is another break in communication, a missed opportunity for the DC-9 to call in and make its presence known, but this does not come for another 20 seconds. 10:13:53 Zagreb Upp Beatours, maintain flight level 370 and report passing overhead Dolsko. Squawk Alpha 2332. Finally, the DC-9 makes contact with the upper sector, at which point it was passing through 32500ft. 10:14:04 JP550 Dobar dan ( Good-day ) Zagreb, Adria 550. 10:14:07 Zagreb Upp Adria 550, Zagreb dobar dan, go ahead. 10:14:10 JP550 325 crossing Zagreb at One Four. 10:14:14 Zagreb Upp What is your present level ? The realisation of what was happening would have put a sickening feeling through Tasic, the unmarked radar paint of the DC-9 was now merging with that of the Trident overhead the Zagreb VOR. To convey the gravity of situation to the Slovene pilot as clearly as possible, Tasic deserted English and used Croatian. 10:14:22 Zagreb Upp [ stammering ] .... e ... zadrizite se za na toj visini i javite prolazak Zagreba ( .... e ... hold yourself at this height and report passing Zagreb ). 10:14:29 Zagreb Upp Na kojoj ste sada u penjanju jer ... e ... imate avion pred vama na ... [ not coherent ] 335 sa leva na desno. ( The height you are climbing through because ... you have an aircraft in front of you at ... [ not coherent ] 335 from left to right ). Tasic watched his screen, he saw the two paints merge, pass for a moment, then vanish from the screen. He called out to the Trident and asked it to report passing the next waypoint at Nasice. 10:14:50 Zagreb Upp Bealine 476, Zagreb .. report passing Nasice. 10:14:56 BE778 Beatours 778, were you calling ..
Tasic continued to call the two aircraft, ignoring calls from other aircraft. The two aircraft collided over the village of Vrbovec, the last 5 meters of the DC-9s left wing sliced through the Trident's cockpit section. Ironically, had the DC-9 were allowed to continue the climb, it would have narrowly missed the Trident. In fact, the DC-9 was slightly above the Trident, carried up by inertia as it attempted to hold 33000ft, it came back down and collided. The DC-9 went into an immediate nose dive, the Trident stayed aloft for a little longer before going down. All 176 people aboard both aircraft were killed, two people, a young girl and a women were found alive, but died soon after. The pilot of Lufthansa 360, a captain Kroese, witnessed the collision. Flying at 29000ft on airway UB5, behind the Trident, he called out on the middle sector frequency. 11:15:42 Zagreb Mid Yes, two aircraft are below you, but I don't understand you, what do you want sir ? LH360 I think there's been a mid-air collision ! Two aircraft are going down with a very fast rate of descent - it might be a fighter, but I think it might also be an airliner ! Zagreb Mid I'm sorry sir ... I don't understand you. Kroese questions whether Erjavec is still in contact with Olympic 187 which was at this time flying along UB9 north of Zagreb at 31000ft. 11:17:19 LH360 Do you still have contact with Olympic airliner ? Erjavec assures him that the Olympic aircraft was headed towards Graz. LH360 Not him ? .... the aircraft ahead of us, I believe it's 172 ? Erjavec again asks Kroese what his problem was for the last time, for the reply will leave no doubt about what had occured a few minutes earlier overhead Zagreb. 11:18:02 Zagreb Mid LH360, this is Zagreb - will you be so kind to say again ? Do you have any problem ? 11:18:12 LH360 We don't have any problem, but in front of us ... about 15 miles or so I think we did see a mid-air collision. It's possible that the other aircraft ahead of us had a mid-air collision ... er ... just over Zagreb. We had two aircraft going down with a rapid rate of descent ... and there was also some smoke coming out. It was at this point that Erjavec looked across to his right to watch Tasic, paled faced, remove the headphones from his ears. Pelin on hearing Kroese's call initially went to the lower sector console to see if they had any problems. He then went to the upper sector and immediately looked out for the DC- 9, which at that time should have been just north of Zagreb, but there was no sign of it. He then looked at the rack containing the flight progress strips and noticed that the British Trident was crossing Zagreb at 14, the same time as the DC-9. An official crash investigation followed, and in April of 1977 court proceedings against seven controllers ( the 5 controllers already mentioned and two supervisors ) commenced. Only Gradimir Tasic remained in custody, the others being released from jail soon after the crash. Although the court proceedings appeared to analyse all the evidence diligently, the end result could only be to portion blame on the controllers. The most single contributing factor for the cause of the crash was the poorly managed coordination for the climb of the DC-9 from the middle to upper sector. It came down to one mans word against the other. Did Tasic simply forget about the DC-9 ? Possibly. Did Pelin misunderstand the instruction Tasic claims to have made, that is to keep the DC-9 at FL310 until passing Zagreb, instead telling Erjavec to climb it without mentioning the amended level of FL310 ? This is unlikely, as Pelin immediately called Vienna to say the DC-9 would be at FL350. It could have been possible that Pelin interpreted Tasic's answer as a yes, and responded as such. Tasic at the time would have been under considerable pressure amounting to his workload, and could have given an obscure answer to Pelin. There were too many other factors that allowed the above situation from happening in the first instance. The fact that Tasic was working the upper sector on his own, at a time of the day that should have demanded he be assisted by a second controller, should be weighed heavily. Hochberger leaving his post without a replacement and then not properly handing over his duties was a significant deviation from standard practice, in fact, Tepes had not been given any debrief of the traffic situation on the upper sector. Had Hochberger been at his post when Pelin came for the clearence, the outcome could have been different. The fact that no flight progress strip for JP550 had been prepared for the middle sector could have influenced the sequence of events on the way DC-9 was handled by the controllers of that sector. The coordination for the DC-9 to enter the middle sector was conducted without a problem, even though there had not been a filght progress strip prepared for that sector. When Erjavec got the request for a higher level, was there a factor of complacency between the controllers that hastened its assent into the upper sector ? It is not unusual for pilots to want to climb as soon as possible to their planned cruising altitude, and the controllers would have been aware of this. Both aircrew were cleared of any actions that could have contributed to the crash, although questions were asked about First Officer Helm reading a newspaper and doing a crossword puzzle. Aircrew are required to keep a lookout for other traffic, but the Trident's crew were flying into the Sun, and the fact that the DC-9 was climbing from below would have made it difficult to spot. The DC-9's crew on the other hand would have had a chance to spot the seven mile long contrail that the Trident was leaving in its wake. Again, studies have proved that even this cue may have been impeaded by the DC-9s windscreen pylon. Apparently the field of vision can be significantly reduced by the pylon, and could have made the contrail invisible prior to the point of impact. Neither pilot took any evasive action to avoid the collision. The question of Tasic talking to the DC-9 pilot in the Croatian language at such a critical point was raised. This removed any hope of the British crew from realising that they were the other aircraft Tasic was refering to, and therfore undertake action to avoid the collision. Although the DC-9s initial call on the upper sector frequency was " 325 crossing Zagreb at One Four ", spoken in English, but it was not enough to have made an impact in the Trident's cockpit. Finally, could have Tasic handled the situation differently when he realised that a collision was imminent ? Tasic claimed that the altitude readout on his screen for the Trident was FL335, or 33500ft. If this were the case, his instruction to the DC-9 to hold its current height would have been appropriate, allowing for a 500ft separation. The problem with this theory was that the radar data tapes from Munich and Vienna had shown the Trident cruising steady at 33000ft. It would have been unusual for the last 12 minutes of the flight to have deviated as much as 500ft. When Tann called in, he said he was cruising at FL330, Tasic had duty to notify any aircraft that was exceeding +/- 200ft from its assigned altitude, but this did not happen. In fairness to Tasic, owing to the workload he had at the time, such a oversight could be understood. The outcome of the criminal case against the controllers resulted in blame for the collision placed soely on Tasic's actions. The judge ruled that Tasic accepted the coordination for the DC-9 to enter the upper sector, and having done so, failed to maintain a safe seperation for that aircraft. He was sentenced for a seven year jail term , but released after two when international Air Traffic Controllers petitioned for his release. Unfortunately, Tasic had been made a scapegoat for an air traffic control system that was allowed to be run down to a state which beckoned for a disaster to happen. Officials from the aviation authority stated under oath that Zagreb ACC was under-staffed by at least 30 controllers, this would remain the case for many years after the crash. It would not be until the early nineties before the whole air traffic control system was revamped. (1) Adapted from the documentary drama 'Collision Course', Granada TV, 1979. I have drawn some material in this account from the book 'Zagreb One Four - Cleared to Collide ?' ( ISBN 0246111852), written by Richard Weston and Ronald Hurst, which I highly recommend if one wishes to study this accident further.